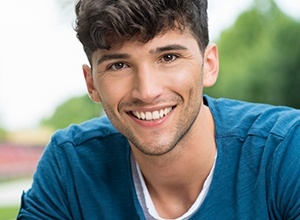 Having a straight smile is an important goal for many patients, and it’s one we’d love to help you achieve here at Meriden Dental Group. Of course, adults tend to shy away from the idea of having to wear metal wires and colored brackets for years on end. Thankfully, there’s a more sophisticated orthodontic option available. Just like the name implies, Invisalign combines the same beautiful results you’d expect from traditional braces with a virtually seamless appearance. The Invisalign process consists of a set of customized, clear aligners that will be created using your unique measurements and overall treatment goals. Each one is meant to represent a different stage of your smile’s progress as your teeth slowly move into their ideal alignment. All you have to do is wear each one for the appropriate amount of time before switching to the next in the set. Additionally, we ask that you attend a brief checkup at our Meriden dental practice every four to six weeks so that we can ensure that your smile is progressing smoothly and there are no problems with discomfort. Before you know it, you’ll be showing off a much straighter, more uniform smile to the world! You’ll be able to improve your look without having to sacrifice your self-confidence in the process – no metal required! The aligners are removable, which means that you can still eat whatever you like and brush and floss normally. If you have a big event coming up that you’d like to look your very best for, you can even remove the aligner for an hour or two while you enjoy yourself. Just make sure to place it back in your mouth when you’re finished. On average, Invisalign treatment takes around 12-18 months to complete, which is a significantly shorter timeframe than the multiple years traditional braces can require. 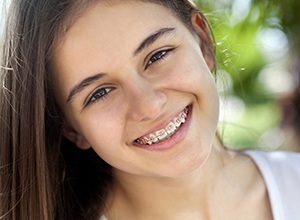 We also offer traditional braces for older kids, teenagers, and adults. With the help of brackets, archwires, and colorful elastics, this orthodontic method places constant pressure on your teeth in order to better align them and create a more uniform appearance for your smile. Our team will be happy to help you choose orthodontic care for you or your child that fits both your schedule and budget. Contact Meriden Dental Group today to schedule an appointment with our team. We offer a truly comprehensive experience to patients through our wide variety of services, including implant dentistry, sedation care, preventive services, cosmetic services, restorative treatments, and much more.